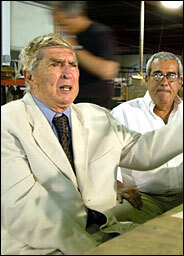 Tim Chapman/The Miami Herald, via Associated Press Luis Posada Carriles, left, held a furtive news conference Tuesday in Florida, hours before he was taken into custody. 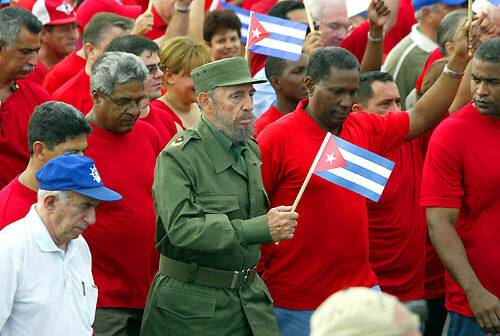 Mr. Posada, a Cuban exile, denied being involved in a 1976 airline bombing that killed 73 people. Chavez asks for extradition of Posada as a part of a new round of negotiations with Bush resulting from the re-election of Chavez. Venezuelan president Hugo Chavez referrences Posada in his address to the UN. At the XIVth Ibero-American Summit in Salamanca, Spain, the final demand to extradite or judge Carriles is declared. Posada's immigration case has a hearing before a Homeland Security judge in Texas on charges of entering the country illegally, but judges rule he cannot be deported due to the 'threat of torture' in Venezuela. U.S. denies Venezuela's extradition request. Lawyers for Posada ask the immigration judge to throw out the government's evidence against Posada, claiming it's based on hearsay and media reports. Attorney Eduardo Soto also argues that Posada is suffering from a relapse of skin cancer and has a worsening heart condition. A Texas judge refuses to transfer Posada to Florida. Posada's immigration hearing before a Homeland Security judge in Texas is set for August 29th. Venezuela submits a formal request to the United States for the extradition of Posada. At his immigration hearing, Posada renews his request for political asylum in the US. Posada's lawyer Eduardo Soto asks the judge to transfer Posada to Miami, where he can be closer to his family and lawyers. Posada is charged with illegal entry into the United States and held without bail. His immigration hearing is set for June 13th. 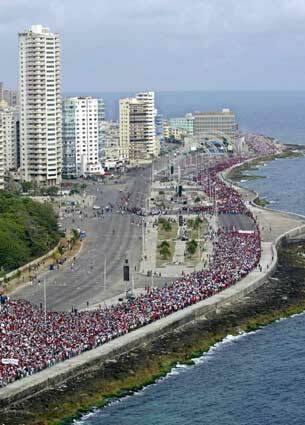 Castro leads thousands of Cubans in a 'march against terrorism' to call for the arrest and extradition of Posada. Posada skips an interview with Homeland Security regarding his asylum case and instead meets with Miami Herald journalists. Posada withdraws his application for political asylum and his lawyer claims he might leave the US and return to his life in hiding. Posada is arrested in Miami and taken away in a helicopter. Homeland Security now has 48 hours to charge Posada and to determine his status. 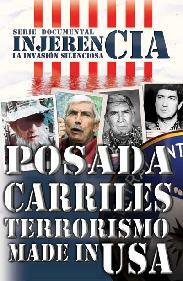 CIP releases a press statement regarding Luis Posada Carriles. Venezuela issues a statement saying their Supreme Court approved plans to formally ask for Posada's extradition. Posada's Lawyer, Eduardo Soto, announces plans to petition for asylum. Cuba and Venezuela call for extradition. US announces that Posada will continue to be detained on grounds of presenting a danger to the community and a flight risk.